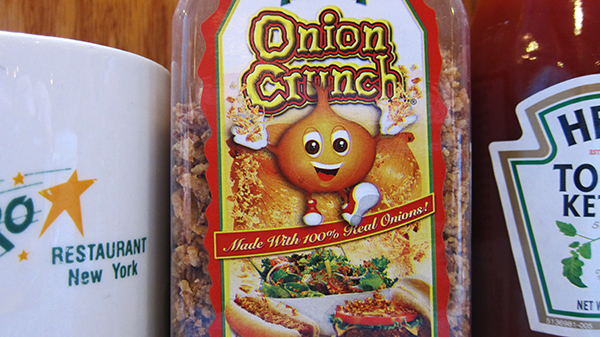 America's newest condiment is Onion Crunch. along with salt, pepper, ketchup, and Sweet'N Low. It's sort of like bacon bits, but more onion-y. It's also sort of like confetti, but more onion-y. If anything, I'm just glad there's an anthropomorphic onion running around now. I like Astro Diner, but not that much. The fact that people review it on Yelp strikes an excellent sweet spot for me -- I think it's crazy and super funny. It doesn't make me laugh out loud, but it makes me feel in a funny mood for, like a half hour after reading the reviews. I think it shows that you are 100% insane if you actually go to Yelp, log in, and write up a review of Astro Diner. It's so crazy to me. It's just a diner -- it's definitely bad, but it's not that bad. It's kind of good. Do you like diners? I do, mostly because you can talk with your friends in an easy and carefree manner. 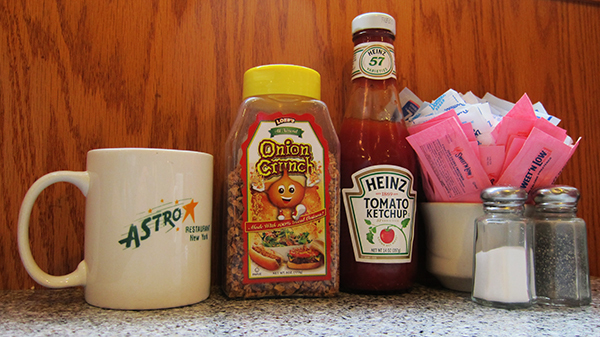 In a diner booth, you can get into it -- gossip, cursing, complaining, whatever. But I hate diners too because they're kind of gross. That's where I eat BLT's and french fries and stupid old chicken fingers. Now, I can always get down on some chicken fingers, but they're fried and mostly frozen, and it's just stupid to eat them. They're bad for you and make you feel like a jerk, but they're probably better than some of those dinner specials that the old people get at 4 in the afternoon. Anyhow, here's my top four out of the Astro Diner reviews on Yelp. I basically don't believe her. I bet she didn't eat in there. This guys CAPITALS game is ON POINT. 11 dollars for a waffle sounds so funny.